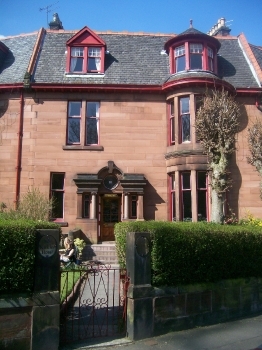 The Kirklee Hotel is situated in Glasgow's leafy West End, an ideal location from which to explore the city and beyond. This area has fascinating architecture and is culturally vibrant; the many bars, restaurants and quirky shops give the area a unique atmosphere. The Kirklee, an Edwardian Townhouse set in award winning gardens overlooking a private park, embodies this sense of place and style. Our 7 day weather forecast for Glasgow updated throughout the day, making it ideal for planning leisure activities, travel and events. Read more about our weather forecasts. On Tuesday 23rd April 2019 the sun will rise at 05:53 and will set at 20:40. It will be a mild day, with temperatures reaching around 19.4°C. Today is expected to be a dry day, with a very low chance of rain. It will be quite a breezy day, with a maximum expected wind speed of 17mph. On Wednesday 24th April 2019 the sun will rise at 05:51 and will set at 20:42. It will be a mild day, with temperatures reaching around 13.3°C. A light shower is possible, 2mm of rainfall is possible today. It will be quite a breezy day, with a maximum expected wind speed of 19mph. On Thursday 25th April 2019 the sun will rise at 05:48 and will set at 20:44. It will be a mild day, with temperatures reaching around 12.9°C. Some moderate to heavy rain is expected, 5mm of rainfall is possible today. It will be quite a breezy day, with a maximum expected wind speed of 13mph. On Friday 26th April 2019 the sun will rise at 05:46 and will set at 20:46. It will be a mild day, with temperatures reaching around 11.4°C. Some moderate to heavy rain is expected, 5mm of rainfall is possible today. It will be quite a breezy day, with a maximum expected wind speed of 18mph. On Saturday 27th April 2019 the sun will rise at 05:44 and will set at 20:48. It will be a mild day, with temperatures reaching around 13.2°C. Today is expected to be a dry day, with a very low chance of rain. It will be quite a breezy day, with a maximum expected wind speed of 12mph. On Sunday 28th April 2019 the sun will rise at 05:41 and will set at 20:50. It will be a mild day, with temperatures reaching around 12.1°C. Today is expected to be a dry day, with a very low chance of rain. It will be quite a breezy day, with a maximum expected wind speed of 16mph. On Monday 29th April 2019 the sun will rise at 05:39 and will set at 20:52. It will be a mild day, with temperatures reaching around 8.8°C. Today is expected to be a dry day, with a very low chance of rain. It will be a very clam day today, with a maximum expected wind speed of 11mph. Our weather forecast for Glasgow is updated throughout the day and has been found to be very reliable for planning activities such as days out, leisure, travel, events, fishing, golf and gardening. The Kirklee Hotel is situated in Glasgow's leafy West End, an ideal location from which to explore the city and beyond. This area has fascinating architecture and is culturally vibrant; the many bars, restaurants and quirky shops give the area a unique atmosphere. The Kirklee, an Edwardian Townhouse set in award winning gardens overlooking a private park, embodies this sense of place and style.